Many of you have read my posts about the value of coaching, clinics and on-going training for technique and fitness. mental attitude is another aspect of training that is invaluable. (Click TRAINING in Categories) Over the years I have been fortunate to become acquainted with the dedication and expertise – and a huge dose of fun – that KIALOA ‘Elele Evelyn O’Doherty brings to her clients. Elder SUP: What was the biggest change you saw in yourself from the beginning to just before Chattajack? Roxane explained, “The biggest change was being nervous about the undertaking of such a race (the distance). There were two time cutoffs, the first 10 miles had to be done in 2 hours and 30 minutes and race had to be completed in 8 hours and 30 minutes. I wasn’t worried about race cutoff, just the first 10 miles. I had never paddled that distance in ven close to that time. Only closer to 3 hours. But there was the hope that the dam had been opened and we would have a helping current. In reality, the dam was not opened and there was really no current. I paddled the first 10 miles in 2 hours. Yea!!! After that, I was fine. But, the Tuesday before Chattajack, while everyone else was nervous, panicky, and freaking out, I had this sense of calm lay over me like a blanket. Comforting. Warm. Calm. I was serene. Not nervous anymore. Not worried about the 10 miles. Knowing, that I was strong, and there was nothing I could do that would change how I did in the race. I was going to be fine. That is all powerful stuff from Roxane. She also shared a bit of back-story. We absolutely agree with Roxane on this next comment, “Age is only a number in your head. I’m proud of my age and that I’m trying new things. A few years ago I got a tattoo on my wrist. ‘Be Fearless.’ My son said to me recently, I love that you’re not afraid to be bad. I asked him for a little clarification on this statement. He said that you aren’t afraid to put yourself out there and try something new. And you might be bad at it, but you don’t care because you’re having fun. And he’s right. I love to have fun. 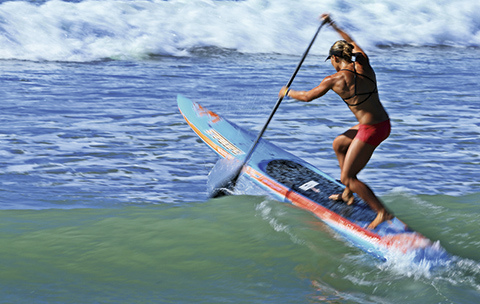 We celebrate SUP athletes like Roxane. When you think you don’t have the skills – you can get them. Roxane is a busy career woman, wife and mother. She had many duties over 2015, caring for her husband with serious health issues – and we all know how draining such a responsibility can be. We can all say, “too busy,” or we can find the support, training and way to paddle toward our passion. Way to go Roxane and Evelyn. 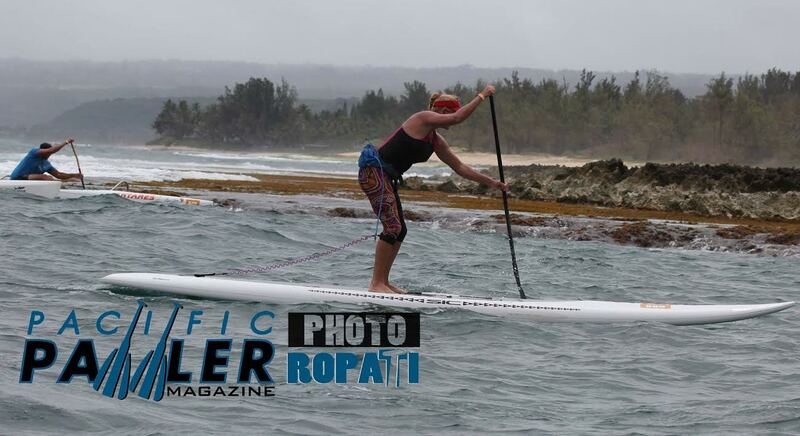 And Roxane continues to compete – her last race was Hamptons Paddle for the Pink! There were brutal conditions out on the bay but Roxane placed 2nd in the women’s 14′ 6 mile race. It’s YOUR life – go for it. During standup paddling, as we work on technique, getting the catch solid is a direct driver of our speed and power. While a great coach and lots of water time can provide improvement, really refining the catch is a long term commitment. In order not to get bad habits, consistent feedback is a must. When I train for standup paddle races and events I do my best to get the stroke right, but what is missing is a constant feedback loop so only my good technique and habits stick. When reach, the power stroke and a hasty return is perfect in timing, the feel and the sound is pure music and synchronicity. 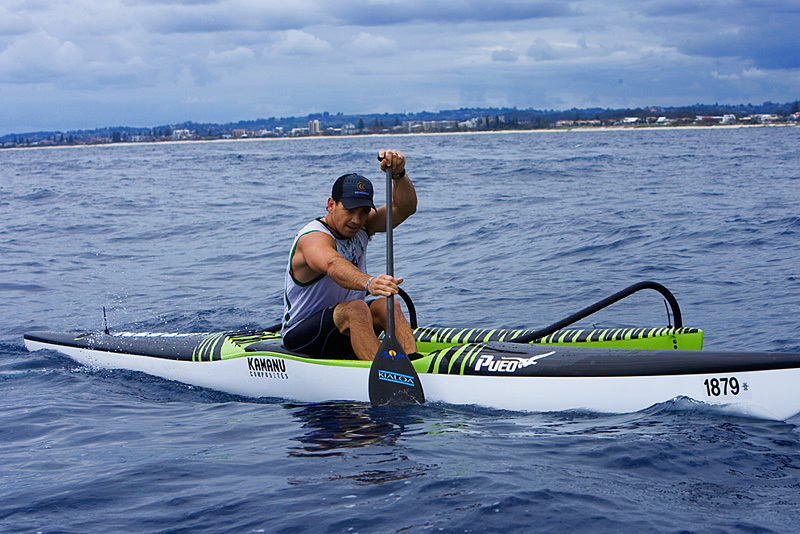 While we can practice these parts of the stroke while standup paddling, every aspect of our technique is even more easily analyzed while paddling with your team in an OC-6. A team provides feedback on so many levels: feel, tips and visual cues from others. I have had the good fortune to paddle in Seat Two behind one of our more experienced team members, Lisa Jakubowski, as she brings us through a practice as stroke in Seat One. We don’t talk while training but recently she mentioned how she was trying to refine her stroke to avoid the “plunks” and “gurgles.” Being so close behind her, mimicking her style and technique, working on timing the best i could, I decided to work to eliminate the gurgle as well. Focusing on the one thing was amazing. It began with watching her upper arm and shoulder as she moved through her power and return phase. As if we were connected, my upper arm/shoulder attached to hers. I began to get some solid timing, great for seat 4 and 6 to follow. Lisa gave me a few tips on how to “feel” that perfect moment between momentum and power when the catch can be ideally executed. At that moment the canoe seems to be moving with exquisite smoothness. The paddle matches the speed of the boat. 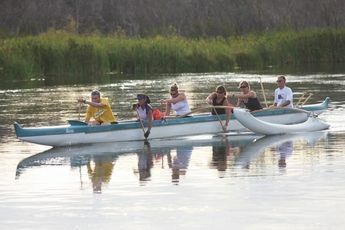 As I began the return with my paddle I gave a gentle punch with my lower arm. This momentum opened my joints and stretched my muscles. The energy of following the action of Lisa in front of me and the timing of the entire team in the canoe fed my ability to maintain speed, power and intensity as needed for all 4 laps of our 2.5 loop on the Deschutes River. It looks simple, in reality it’s GENIUS! First of all, what is the Rip Trainer? Well, it consists of a resistance cord attached to a pole. You get a workout DVD and guide and a door anchor which works really well. If you have a door (or a tree or a banister) you have a fix point. In summer and fall we will use the TRX Rip Trainer in our garage, but during the winter we will bring it into the house where there is HEAT! 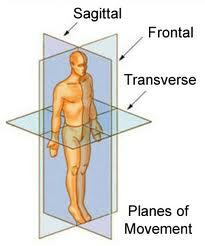 We can easily move our training are to any room with a door and adequate space for moving. Our first step was to watch the DVD included in the purchase. We buy a lot of fitness and sports equipment. Too often the DVD training is less than stellar. We were 10 – star impressed with the professionalism and information shared by each of the experts in the DVD. While too many knee and shoulder surgeries have provide us with lots of insights on rehab and the physiology of the body, the careful explanation of how the spine works and why the TRX system provides movement challenges in many different planes of motion was enlightening. It wasn’t long after watching the dvd that we set out to do the Beginner Workout. After the warm-up we did a few planks, a practice we like for controlled rotation using the entire body. Next we were ready for a session of producing rotation with the RIP Trainer. As Ed is returning to standup paddling after 5 months of shoulder rehab, mitigating the risk of future injury is a top priority. The expert guidance throughout the beginner workout was exactly the confidence-building we wanted. This is certainly NOT to say that the beginner workout was easy-breezy. It’s incredible how versatile the workout intensity can be. Simply increasing the frequency of the movement or stepping further from the fixation point of the cord UPs the intensity. Both the spiral movement patterns and the unbalanced rotation of the force provided a controlled activity that worked the core and specific parts of the anatomy safely. As we are learning how complex even the easy to follow exercises are, we moved relatively slowly during our first session. As the weather is turning cooler here in Oregon we won’t be able to get into the water as often as we like. For me, simply standing on my board in bare feet is fun. I love to practice balancing on my Indo board with its smaller roller. With the addition of the TRX RIP Trainer to our workout area I decided to try using the Gigante cushion with the Indo board as the platform for trying some of the TRX training moves. I am absolutely NOT a fan of sit-ups. After a summer of paddling an hour or so 5 days a week I gained solid evidence of SUP as an ab exercise that delivers core strength and balance. What a foundation! In order not to lose that foundation during cooler months I decided to combine some moves. I fixed the TRX RIP Trainer a bit lower than usual (with the door connection, included). Standing in a stance with feet parallel on the Indo board on the Gigante cushion facing the door, I began to mimic paddle strokes. My lower hand was closest to the cord, on the low end of the “paddle.” Slow and steady didn’t seem like much of a workout until the next day – wow! Quads and abs, even my lats were definitely worked! Be sure to do the same movements on each side for symmetry. I have been following some great training suggestions on Suzie Cooney’s blog so I decided to quickly review some of her tips for using the TRX. If you search through the site you’ll find solid information and have the ability to connect for a custom session via Skype.